NOTE: The blog below was originally posted in November 2017 and is repeated here again following Tony’s demonstration at the Club meeting on Monday last. Tony’s post-processing demonstration will be posted soon.. 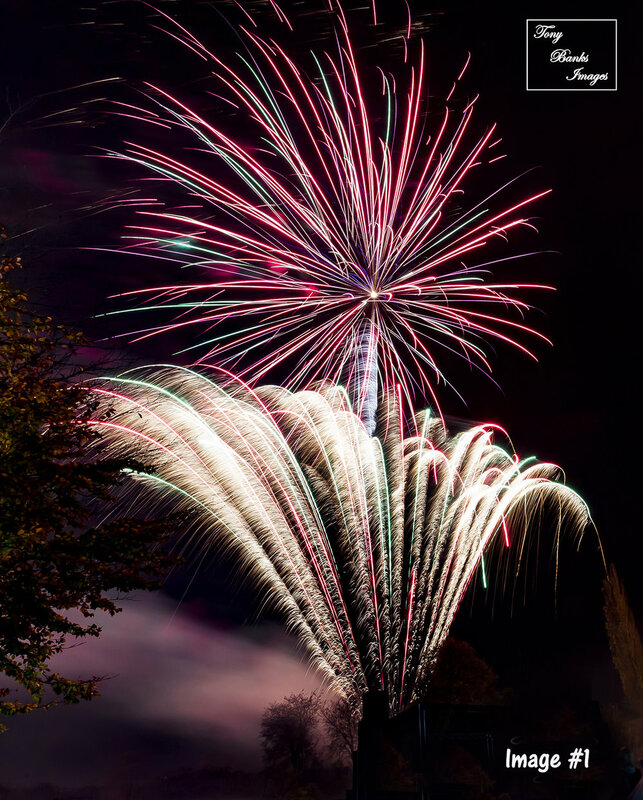 Taking photographs of an organised fireworks display is something that many photographers do not attempt, feeling that it is too difficult to get sharp, clear images because they are unsure of what settings are the best for the camera. From my experiences, there are a few basic, simple guidelines that will aid the production of some wonderful images and I try to explain these in detail in this tutorial. Before we even consider other issues there is one basic thing that we need to ensure – we must have a clear view of the fireworks area, so that our images are not destroyed by having members of the public moving into the shot, or even worse, in front of the camera. The answer to this is simple – apply well in advance of the event to the organisers for a Photo Pass, and agree with them in advance an area where you can set up your equipment, this being separate to that open to the general public. This might be a roped off area, or even something quite bizarre such as when I recently carried out a shoot from the top of an event security centre – which was an open-topped double decker bus! I always carry out a pre-event visit to the location, and after getting clarification from the organisers as to what will happen (e.g. where will the fireworks emerge from? Will there be a bonfire and where will it be? Where will the public be, and where can they not go? etc) I work out where I want to shoot from to give myself the best chance of success. 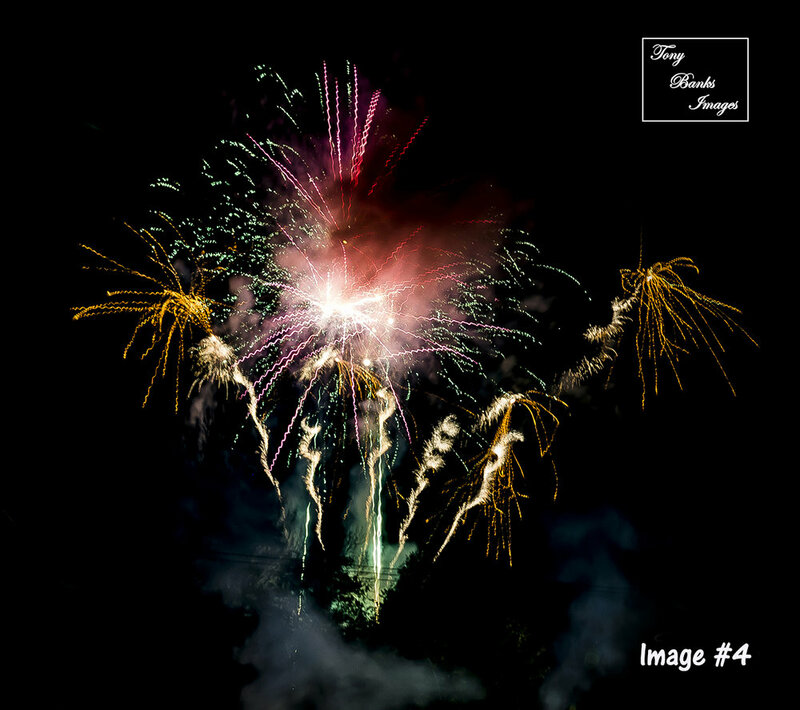 Let’s understand one thing right from the outset – it is virtually impossible to get a top-quality fireworks image using a hand-held camera. We MUST use a tripod. We do not want any unnecessary blurring of our images, and therefore a remote shutter release must also be used as physically pressing the shutter release button will cause problems. Also, forget auto-focus, manual focus is essential. Manually set the focus to where you believe the fireworks will appear and after a couple of test shots you will be able to see on the back of the camera whether you have got it about right, or whether you need to make any minor adjustments. Through a process of trial and error, I have found that an ISO of 400 is ideal for this type of work. I have also found that I get the most fireworks in focus when using an aperture of f16 and that Spot Metering is the most appropriate setting to use. What shutter speed should we use? Well, this is where we use what is probably the most under-utilised setting on our camera. We set the shutter by applying BULB status. Have you used this setting before? Possibly not, but it is crucial for getting great fireworks shots. Using our remote shutter release, and with the speed set to Bulb, we will open the shutter by pressing the remote release button once. We will then close the shutter by pressing it again after we are satisfied that we have left it open for long enough. A quick look at the back of the camera will give us a good idea as to whether we are getting it anything like right. So, how long do we keep the shutter open for? Well, this is where we must apply all of our technical knowledge and expertise, make various calculations, and then use the absolutely necessary tool – GUESSWORK!!! Experiment with various shutter times – there is no film to develop, so there is no cost involved in taking loads of pictures. Most organised firework displays last for 15 minutes or so, and my camera shutter is being constantly opened and closed for the whole of this period so that I can get as many shots as possible, but with a variety of shutter speeds. Below are three more sample images, with the timings for each. Shooting firework displays is great fun, give it a go and enjoy yourself. In the next tutorial I will discuss the processing of fireworks images. This shot was taken with the settings ISO 400, f16, spot metering, 16-35mm zoom @ 16mm and I kept the shutter open in this particular case for 11 seconds.